Frank Temile - finalist in three categories of the Malta Football Awards. 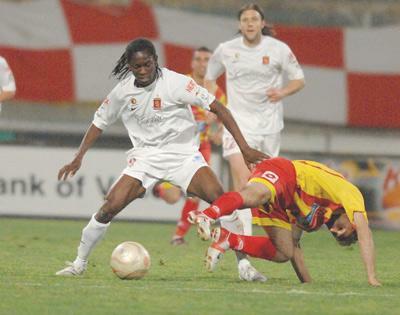 The 2007-08 season has already been consigned to history but local football will be at the centre of attention again tonight with the staging of the seventh edition of the Melita Digital Malta Football Awards. There are high expectations of another well-attended, glamorous night at the Corinthia Palace Hotel with players, coaches and fans hoping to leave their mark in this year's contest. Inevitably, Valletta, the 2007-08 Premier League champions, are widely tipped to claim the lion's share of honours at tonight's awards. A glance at the names of the three finalists in each of the 15 main categories would reveal that only a handful of players are in contention for more than one award. Valletta's young Nigerian forward Frank Temile has been shortlisted for three accolades, namely Most Promising Youngster, Best Foreigner and Best Forward. Gilbert Agius, the Valletta captain, and Marsaxlokk's Kevin Sammut are vying for the same two awards, Best Midfielder and Best Maltese Player, while Valletta's Andrew Hogg is a finalist in the Best Goalkeeper and Best Maltese Player categories. Mqabba's Brazilian striker Marcelo Pereira, who is being linked with a move to Marsaxlokk, is also in with a shout for two awards, Best Foreigner and Best Forward. Apart from the 15 categories of which the finalists have already been unveiled, another two prizes - Special Career and Coke Zero Best Support awards - will be announced during tonight's presentation ceremony which will be televised live on Melita Sports and the Weather and Information Channel. Voting for the best support award, designed to reward the most-organised and colourful supporters during last season, is still open. Members of the public can indicate their preference by sending a text message to 50614914. At the launch of the Coke Zero Best Support Award almost two months ago, organisers encouraged fans to take part in this competition by uploading their pictures and videos on www.cokezero.com.mt in the super fan section. The response for this initiative has been very encouraging. In the meantime, Sandro Micallef, chairperson of the Malta Football Awards, has described the participation of those who were entitled to vote for the main Premier League categories as very satisfactory. Ninety-six per cent of the 45 football journalists and the presidents, coaches and captains of the 10 Premier League clubs last season, submitted their voting documents to the organising committee by the stipulated date. Best Goalkeeper - Omar Borg (Birkirkara); Reuben Debono (Marsaxlokk); Andrew Hogg (Valletta). Best Defender - Ronnie Hartvig (Birkirkara); Josef Mifsud (Valletta); Brian Said (Sliema). Best Midfielder - Gilbert Agius (Valletta); David Camilleri (Valletta); Kevin Sammut (Marsaxlokk). Best Forward - Sebastian Monesterolo (Valletta); Marcelo Pereira (Mqabba); Frank Temile (Valletta). Best Coach - John Buttigieg (Birkirkara); Brian Talbot (Marsaxlokk); Paul Zammit (Valletta). Most Promising Youngster - Steve Bezzina (Valletta); Ryan Fenech (Ħamrun); Frank Temile (Valletta). Best Maltese Player - Gilbert Agius (Valletta); Andrew Hogg (Valletta); Kevin Sammut (Marsaxlokk). Best Foreign Player - Marcelo Pereira (Mqabba); Njongo Priso Doding (Msida SJ); Frank Temile (Valletta). Best Female Player - Eleonora Agliano (Birkirkara); Catherine Camilleri (Birkirkara); Sharon Costantino (Melita). Best Veteran Player - Darko Krsteski (Floriana); Sean Sullivan (Ħamrun); Stefan Sultana (Ħamrun). Best Goal - Michael Mifsud (Malta vs Liechtenstein 26/03/2008); Kevin Sammut (Marsaxlokk vs Floriana 21/04/2008); Ivan Woods (Sliema Wanderers vs Marsaxlokk 26/04/2008). Best Futsal Player - Zeljko Anicic (Jeepers FC); Predrag Babic (Scandals FC); Noel Bray (Southenders FC). Best GFA First Division Player - Chris Camilleri (Nadur Y. ); Daniel Farrugia (Victoria H.); Errol Grima (Sannat L.). Best First Division Player - Anthony Ewurum (Senglea); Joseph Farrugia (Qormi); Elton Vella (Mosta). Best Second Division Player - Kurt Coleiro (Balzan Y. ); Julian Galea (Melita); Adam Smeir (Rabat A. ).